Arthritis is a chronic (meaning it will last for a long period of time) condition where inflammation exists in one or more joints, and can cause pain and stiffness. The pain can either be very bad for a short time, or less painful but more damaging to your joints in the long term. This condition usually becomes more prominent as you age, the two most common kinds being osteoarthritis and rheumatoid arthritis. Know that there are over one hundred kinds of arthritis, but we will discuss the two most common ones. This type of arthritis is typically the more common of the two types in senior people. In osteoarthritis, the cartilage, which is essentially soft pads between our bones, begins to wear away which leads to our bones rubbing each one another. As this occurs, the tendons and ligaments start to stretch, which is a part of the pain you experience, while the rubbing sensation between the cartilage deficient bones causes more severe pain. Osteoarthritis can occur in the neck, lower back, hands, or any major weight holding joints like the knee. Osteoarthritis can be linked to many factors, including age, weight, and even genetics, depending on the area of the body that has been affected. Because our natural tissue begins to wear away as we age, more senior people are more likely to have this condition. Our knee is a major joint that holds our body weight, and will experience more pressure if an individual is overweight, which can eventually lead to osteoarthritis. This type of arthritis is more of an autoimmune disorder that primarily attacks the synovium (lining of joints). These joint linings are what the body uses to protect us from any diseases or injuries. Rheumatoid Arthritis will appear as inflammations in the joints which causes red and swollen skin, pain, swelling, and stiffness in the affected joint, typically for several hours. Any joint in the body can be affected by this condition, and will affect the same joint on both sides of the body (ie, left knee and right knee). Even organs like the heart, and eyes can be affected as well. This condition is also more common in females than men, and in those aged between 40 and 60 years of age. There are some things you can do for any kind of arthritis. Having a healthy and balanced diet, doing regular exercise, and getting a good amount of sleep, and not over-using your joints are all good ways to cope with arthritis, or even to prevent it. Once you have arthritis, the main goal of treatment is to lessen the effect of symptoms and improve one’s quality of life. 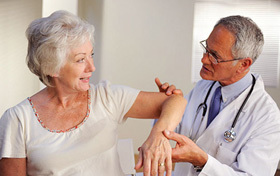 Some medicines also exist to help with the symptoms that come along with arthritis. For instance, the joint pain can be eased using a drug called Acetaminophen. Some anti-inflammatory drugs that don’t require a doctor’s prescription to use are ibuprofen and naproxen (NSAIDs). However, these drugs shouldn’t be used unless recommended by a doctor, because there can be side effects, allergic reactions, or unwanted reactions to them. Because weight is a major factor, weight loss is a good way to reduce symptoms, which will result from a good diet and regular exercise. The pain can be controlled with doctor-prescribed medicine, and for some severe pain, shots can be administered. In extreme cases, surgery is used to repair/replace joints damaged by osteoarthritis. DMARDs (disease-modifyinggantirheumaticdrugs) are typically recommended by a doctor, which will reduce the speed of the damage caused by this disease. The joint pain and inflammations are treated with anti-inflammatory drugs, as mentioned above, as well as pain medicine. In cases where these methods aren’t effective, biologic response modifying drugs will be administered, which basically blocks damage caused by the immune system.